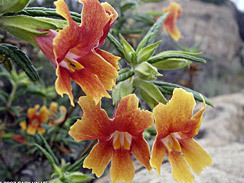 Sticky Monkey Flowers are one of my favorite wild bouquet flowers. I pick them atop our towering neighborhood cliffs. They’re often nestled in the shade of large boulders. Their flower color ranges from pale yellow, to orange and deep brownish red. 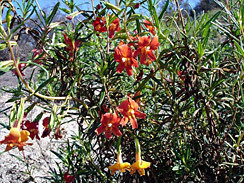 Sticky Monkey Flowers are a woody shrub, and thrive at elevations 1100+. Their flower is said to look like a laughing monkey’s face, and look almost identical to the flower of a sister plant simply called Monkey Flower (also a wild edible plant). 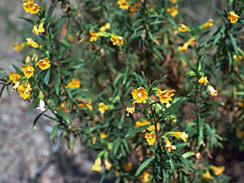 Unlike the Monkey Flower which has large roundish leaves, the Sticky Monkey Flower’s leaves are long and thin, and contain a volatile oil making them slightly sticky to the touch. Flowers and leaves are edible. The leaves have a very, very strong unique flavor, mildly bitter while reminiscent of mint. Like strong sages, its taste bud power makes it ideal as a flavorizer for animal products. Use leaves to flavorize flesh (fishies, birdies, mammals – though I personally don’t chow down on critters who could’ve been loved by their mothers). Slice into thin(!) strips to release volatile oils, then lay on flesh while cooking. I haven’t used the flowers yet, but will report when so. Leaves can be used in pickling (see my pickled wild radish pod recipe below), and as seasoning for eggs (Lamb’s Quarters Egg Scramble).